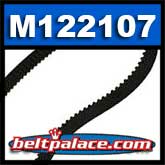 M122107 Aftermarket brand John Deere Blade Drive Timing Belt. 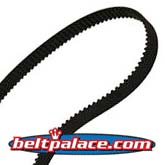 OEM Replacement Secondary synchronous drive belt replaces John Deere M122107. CLEARANCE ITEM: SPECIAL PRICE WHILE SUPPLIES LAST. Fits for John Deere models GS25, GS30, GS45, GS75 commercial walk behind mowers. Fits for John Deere HD45 and HD75 Hydro-static commercial walk behind mowers. (John Deere "Freedom Deck") "Notched Top" tooth profile synchronous timing belt. Standard tooth profiles will not interchange!